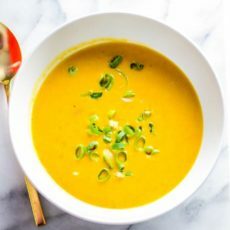 High in Vitamins A + C, this dairy-free, gluten-free butternut squash soup recipe is an easy winter dish, made with nourishing bone broth + delicious curry. In a large dutch oven, saute onion in olive oil until soft, about 4 minutes. Add garlic and cook until aromatic, about 1 minute. Add red pepper flakes, ginger, cinnamon and curry powder, toss to combine and cook until fragrant, about 1 minute. Add carrots, squash and sweet potatoes, tossing to combine. Cook until softened, about 5 minutes. Pour coconut milk and chicken broth over veggies and stir to combine. Season with salt and pepper. Cover pot and reduce heat to medium-low; cook for 25 minutes. Uncover and blend soup using an immersion blender. If you don't have one, you can blend the soup in batches in a traditional blender. Serve and enjoy!